For thousands of years, copper has been recognized for its many health benefits – from increasing energy levels – to reducing pain associated with swelling, inflammation and arthritis. But recent studies have shown that only about 25% of the population actually consumes the recommended daily intake for copper. 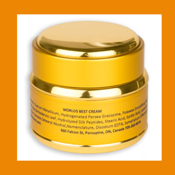 The World’s Best Arthritic Cream allows your body to absorb copper directly through the skin – resulting in reduced aches and pains. Unlike bracelets that release microscopic traces of copper at the wrist – The World’s Best Arthritic Cream delivers a proprietary blend of copper-centric ingredients directly to the part of your body that needs it most. Simply rub the cream to the area of pain or inflammation when needed.